Improper roof ventilation and attic insulation may seem like small issues, but they can actually lead to very expensive repairs and unnecessarily high utility bills. As homeowners, it’s important to be knowledgable on how your roof and attic should ventilate and be insulted. 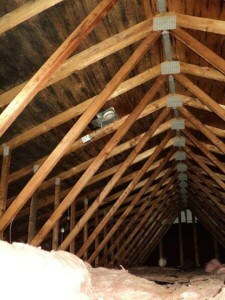 An investment in proper roof ventilation and attic insulation is an investment in future savings and comfort. Excessive moisture caused by poor roof ventilation and attic insulation can deteriorate your entire roofing system from the decking and supports to the underlayment and shingles. Ice dams are caused when the heat that escapes from a poorly insulated attic melts snow on the roof that refreezes at the edge of the roof before it drips off. The ice accumulates, pushes under the shingles and leads to major damage when the ice melts. Moisture causes metal components of the roof, like nails, to rust and potentially break — which can lead to shingle loss. The moisture caused by condensation on the inside of the attic can also rust things like plumbing, heating, and venting duct straps to rust and break. Excessive heat will cause your air conditioner to have to work harder and longer to cool your living space. It also means repairs and replacements to your overworked air conditioner will be needed sooner and more often. Excessive heat: In the warm months poor roof ventilation means there is no way for the heat that is created by the sun beating on the roof and the heat that rises from the rest of the house to escape. Instead it pushes downward into the living space raising the temperature and the electric bill. Mold: In the winter months, the cold air in the attic meets with the rising moist warm air from below caused by things like cooking, heating and showering and creates condensation. The condensation drips, turns to mold, the mold wafts in to your living space and — according to the Center for Disease Control — has the potential to do anything from triggering allergic reactions to causing asthma in young children. Excessive and accumulating condensation can rot structural wood components leading to unnecessary expenses, and mold can accumulate on items being stored in the attic leading to unnecessary loss of property. 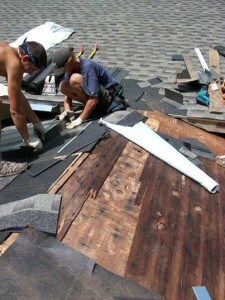 If you’re concerned you may have inadequate roof ventilation and/or poor attic insulation, we can help!